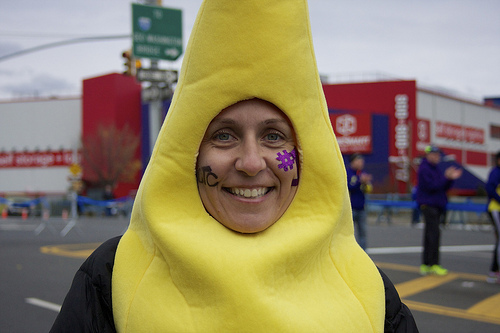 Amid the crowd of spectators attending the ING New York Marathon in Long Island City, Queens, a band decked out in purple and white uniforms and cowboy hats kept both runners and viewers energized with drums and blaring trumpets. A closer look revealed that this was no ordinary band. 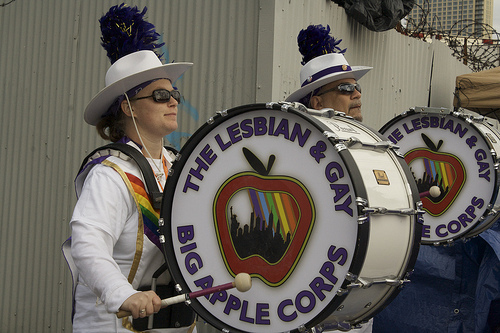 The Lesbian and Gay Big Apple Corps Marching Band proudly wore LGBTA ( Lesbian Gay Bisexual, Transgendered and Allies) and the iconic rainbow on their chest. This is the first time the LGBAC is performing at the marathon. Band manager Lindsay Becker said it had been a very positive experience, with runners passing by waving and blowing kisses to the band members who gave them encouraging yells and fist pumps in return. 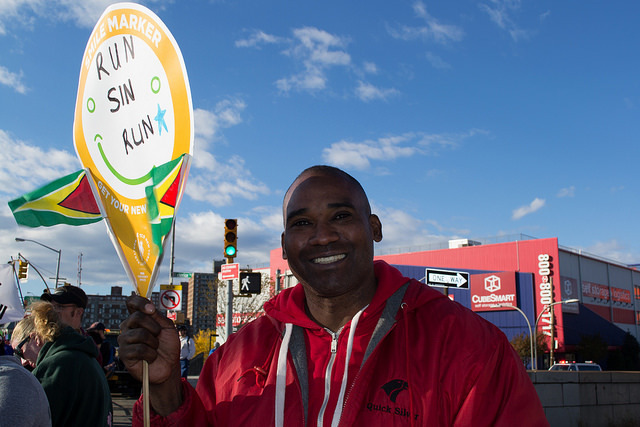 “Everyone running is just so inspiring and it’s thrilling to stand here and give them a little pep right here in the middle,” said Becker. Dyanne Irby, a self-admitted “rookie”, joined the band only a few months ago when her roommate encouraged her to look into it. Irby, a sousaphone player in the group, is originally from Maryland and has lived in San Francisco as well, but feels more at home in New York City after moving here in 2001. She enjoys big city events like the marathon. 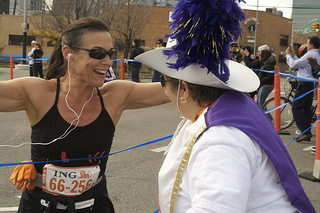 The marathon draws thousands of runners from all over the world. 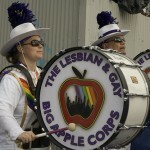 The Lesbian and Gay Big Apple Corps, which is made up of 85 members, was formed back in 1979, ten years after the Stonewall Riots said Leslie Becker, percussionist and band resource coordinator. 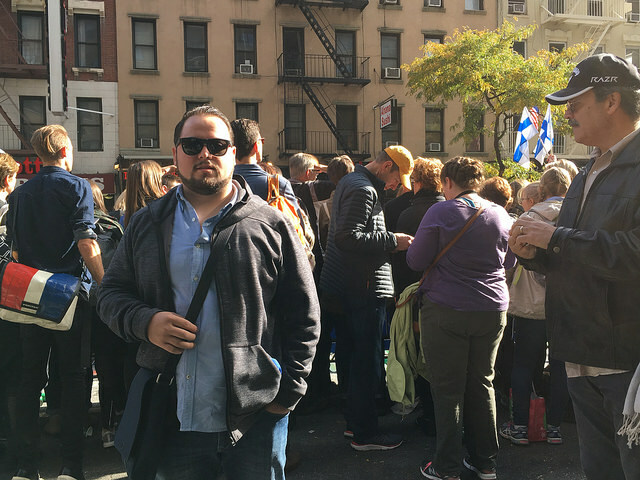 Becker said the LGBAC plays at many events in New York City throughout the year including the New York City Gay Pride Parade, the Fourth of July Parade, and the Washington Market Children’s Halloween Parade. But one event in particular stands out in Becker’s memory.